Whenever I ask venture capitalists how they find interesting new apps and start-ups, they mention App Annie, so it makes total sense that a few of them would get together to put money into their favorite tool. The company, which is aiming to be a sort of Nielsen for app stores, has raised $6 million in Series B funding led by Greycroft Partners and others including e.ventures, Infinity Venture Partners, Kii Capital and previous investor IDG Capital Partners. 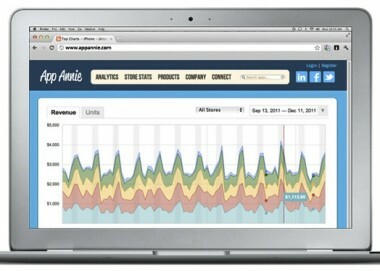 Beijing-based App Annie gives away substantial analytics for free on iOS, Android and Mac, both free and paid apps. The company says more than 100,000 apps use these tools, including 80 percent of the Top 100 iOS apps. While keeping its free users’ data private and anonymized, App Annie plots a curve to make market estimates for app sales, revenue and downloads on each platform and in each country. These approximations aren’t exact, but they tend to be reasonably close, the company says. This is App Annie’s paid product, bought as a subscription service by publishers such as Gree and Storm8 and platforms like Microsoft and Nokia. The market estimates help answer questions like how many downloads it takes to get into the Top 10 in a certain country, or whether a certain category of app has become popular in various regions. I asked lead investor Dana Settle, a partner at Greycroft, about her experience using App Annie, and she said its stats had been endlessly cited by one of her associate partners, which got her attention. “We were a free customer. Now we’ve overpaid,” she joked. Settle said she’s not worried that native app stores will go out of vogue as mobile Web apps improve. App Annie’s competitors include Distimo and appFigures. The company spun out of Beijing-based software consultancy Exoweb, which had developed its own popular iOS game, High Noon. With poor existing app-analytics tools — for instance, the Apple App Store clears app data every two weeks — Exoweb built its own. After releasing the paid intelligence product, App Annie has been cash-flow positive since last year, according to CEO Bertrand Schmitt.